Steinhoff said, “Overall played well, we made good decisions offensively and thought we guarded really well. For the most they are really smart group." Ben Luecke lays it in for two of his points. In the first half the game was tied four different times and the lead changed hands three times. Montgomery out scored New Haven in the second 12-6 going into halftime with a two-point lead, 19-17. But Ruediger caught fire in the third, scoring 14 of his 26 points. Midway through the third Montgomery’s Justin Hall knocked down a jumper, giving them the lead 24-23. 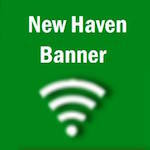 On the ensuing play Seth Schenck drove down the lane, dishing it off to Ruediger who converted the “old fashion” three point play and sparked New Haven on a seven to one run giving the Shamrocks a six point lead. The Wildcats trailed by four with 48 seconds left in the third and potentially could have worked for a last second shot, but two costly turnovers lead New Haven scoring five straight points, leading 35-26 after 24 minutes of play. Montgomery never recovered, scoring only four points in the fourth after going six and half minutes without scoring. New Haven will have their hands full Thursday night against Mexico. The past two years New Haven has lost by one point in the Montgomery County Championship game. Steinhoff said Mexico would be the best team they will probably face all season. Tip off is set for 7:30 p.m. and we will keep you updated throughout the game.